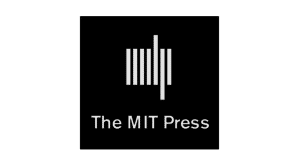 “While the Nazi party was being condemned by much of the world for burning books, they were already hard at work perpetrating an even greater literary crime. 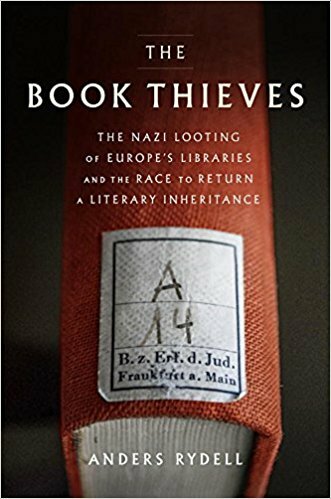 Through extensive new research that included records saved by the Monuments Men themselves—Anders Rydell tells the untold story of Nazi book theft, as he himself joins the effort to return the stolen books. 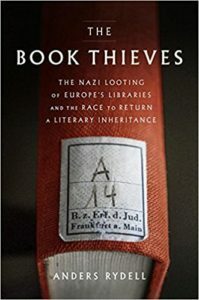 When the Nazi soldiers ransacked Europe’s libraries and bookshops, large and small, the books they stole were not burned. Instead, the Nazis began to compile a library of their own that they could use to wage an intellectual war on literature and history. In this secret war, the libraries of Jews, Communists, Liberal politicians, LGBT activists, Catholics, Freemasons, and many other opposition groups were appropriated for Nazi research, and used as an intellectual weapon against their owners. But when the war was over, most of the books were never returned. Instead many found their way into the public library system, where they remain to this day.